When the building at the current site of the Olympia Oyster House was first constructed in 1924, the neighborhood was already a thriving center of water-based businesses. 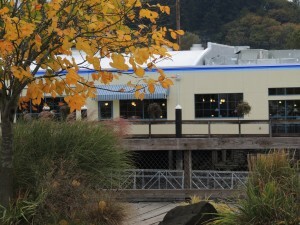 In addition to the Olympia Oyster Company, the waterfront included the Capital Oyster Company and the J.J. Brenner Oyster Company next door. In those days, the Olympia oyster — a smaller native species compared to the more currently dominant Pacific oyster — was the center of the shellfish industry. The tiny bivalves were brought to the packing plant by boat from tidelands across southern Puget Sound. They were then prepared for sale and then shipped to retailers and restaurants. The Olympia Oyster Company plant itself was designed by noted Olympia architect Joseph Wohleb, who designed many important buildings including Cloverfields and the current Washington State Capitol Museum. 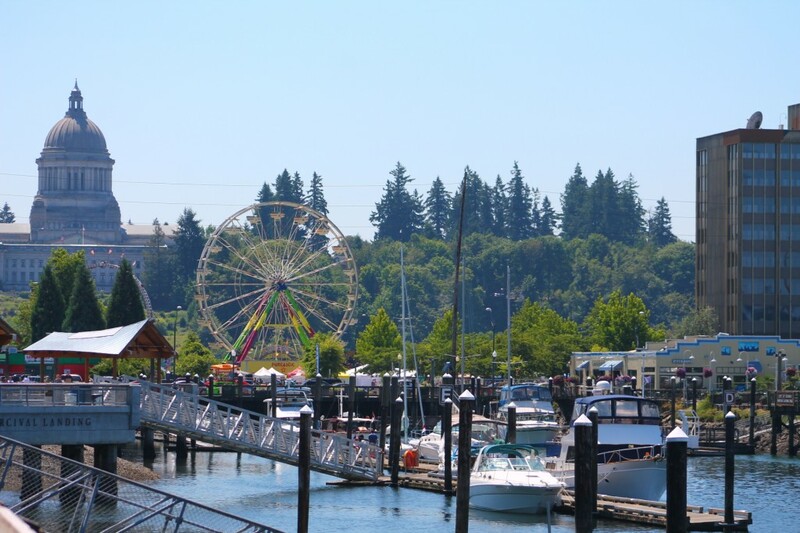 The original Olympia Oyster Company operation extended on a wharf well into the area currently used by the Olympia Yacht Club. But, as business contracted into the 1940s due to the decline in the health of Olympia oysters, the current packing plant became the last building left on the wharf. 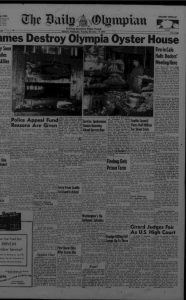 A 1957 article from The Olympian recounts a previous fire at the Olympia Oyster House. The article continues to discuss the merits of the business. “These dreams were realized when, in 1924, a concrete building was erected and equipped with the latest and best known machinery used in an opening plant including refrigerating rooms and a sterilizing plant. So now — even while some Olympia oysters were still being served — the name Olympia Oyster House refers to the city in which the restaurant is. But at one point in our past, the Olympia in the name of the company referred to the Olympia oyster. Due to industrial pollution from lumber mills, the native Olympia oysters eventually declined to the point where they lost their commercial value. 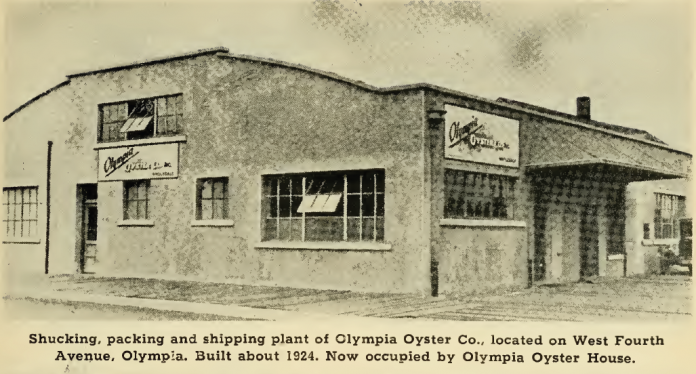 Most of the old Olympia production was replaced by non-native Pacific oysters. 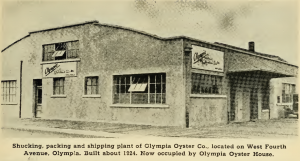 During the decline in the Olympia oyster, a small oyster bar was added to the front of the packing plant. By the 1940s the building had transformed completely into a restaurant. In addition to the July 2013 fire, there have been at least two other recorded fires since the building was turned into a restaurant. The first is reported to have occurred around 1946. After that fire, it was rebuilt to its previous state. The same article also gives some of the history up to that point. The Olympia Oyster House has been a landmark along the Olympia waterfront for decades. The restaurant was likely the most visible establishment at that time because it was on the waterfront and along Olympia’s main east to west thoroughfare. The large number of doctors in attendance at the Oyster House that 1956 night also makes sense since St. Peter’s Hospital was then located just a mile or so away, across the bridge and up Fourth Avenue. Throughout the decades, the Olympia Oyster House was a mainstay in Olympia. But, in the mid 1990s, the restaurant fell on hard times and closed. After an auction emptied out the old restaurant, the building sat vacant for about a year until it was sold to its current owners, the Barrett family. In the mid-1990s, what had most recently been called the Olympia Oyster House sat empty for about a year, and was for sale. The Barretts weren’t new to the food industry when they vowed to take on renovations to return the restaurant to its previous glory. Rich had done some culinary training up in Seattle and his parents had owned Dairy Queen eateries, including the one that used to be on Capitol Way. “I grew up in that business,” Rich says. But soon enough the restaurant was up and running smoothly, after opening in July of 1996. E.N. Steele, Rise and Decline of the Olympia Oyster.